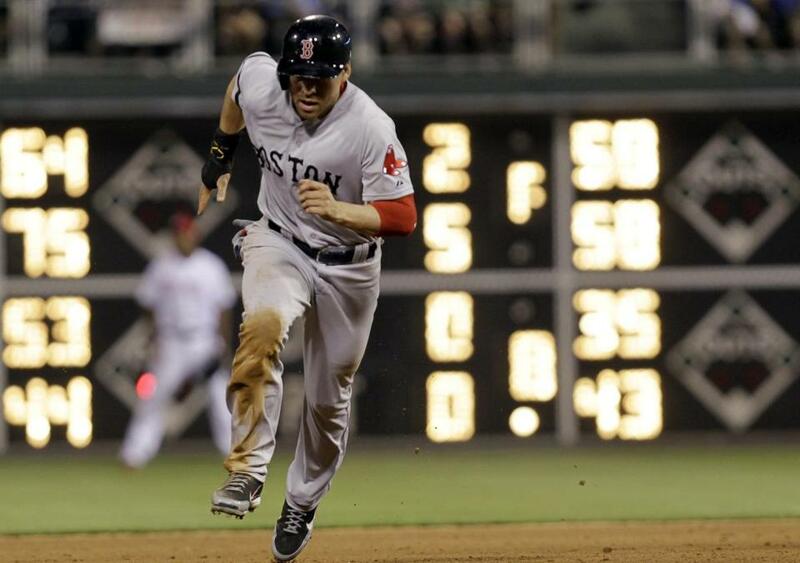 Jacoby Ellsbury had three hits, a walk, and a club-record five stolen bases as the Red Sox won, 9-2. PHILADELPHIA — If Shane Victorino had been healthy 10 days ago, Red Sox manager John Farrell might have hit him leadoff and dropped Jacoby Ellsbury down. Ellsbury was struggling to get on base and had become a detriment to the offense. But without a suitable replacement, Ellsbury remained where he was. Ellsbury isn’t moving any time soon, except around the bases. He had three hits, a walk, and a club-record five stolen bases Thursday night as the Red Sox beat the Philadelphia Phillies, 9-2, before 40,083 at Citizens Bank Park. The five steals were the most for a major league player since Tampa Bay’s Carl Crawford stole six bases against — you guessed it — the Red Sox on May 3, 2009. Ellsbury did not score after any of his steals. But the runs will pile up if he continues to get on base. The 33-22 Sox split the four-game, home-and-home interleague series against the Phillies. With the Yankees getting swept by the Mets, the Sox take a two-game lead into the Bronx on Friday and the start of a three-game series against their rivals. Ellsbury was 0 for 4 against the White Sox May 20, grounding to second base four times. That dropped his batting average to .241 and his on-base percentage to .303. Since then he is 16 of 40 (.400) with eight walks, six runs, and eight stolen bases. Ellsbury is now hitting .268 with a .337 OBP. Ellsbury’s 21 stolen bases (on 23 attempts) lead the majors. Ellsbury was so unstoppable against Phillies catcher Erik Kratz that he even used his speed to gain vengeance. Teammate Jonny Gomes homered off reliever Jeremy Horst in the sixth inning and the next pitch was a fastball that drilled Ellsbury in the back. Ellsbury stole second and third, glancing back at the pitcher each time. The Phillies gave Ellsbury a base to take home as a souvenir. In case you were wondering, bases are left dirty when they’re framed and hung on a wall. The Red Sox had 14 hits off four pitchers. Jarrod Saltalamacchia doubled twice and drove in three runs. Jose Iglesias was 2 for 5 with an RBI double. He is 9 of 23 since getting recalled from Triple A Pawtucket. Franklin Morales allowed two runs over five innings in his first appearance for the Sox since Aug. 22. The lefthander ended last season on the disabled list with a shoulder injury and started this season sidelined with a back injury that occurred during spring training. “I was very excited to be out there,” Morales said. When Clay Buchholz was given some extra days off to deal with shoulder pain, Morales was given a start. He allowed a two-run homer by Delmon Young in the first inning but was otherwise strong. His biggest moment came in the fourth inning. With the Sox up, 4-2, the Phillies loaded the bases with one out as Jimmy Rollins walked, Domonic Brown singled, and Kevin Frandsen walked. When Kratz hit the ball slowly to shortstop, Stephen Drew charged and made a quick feed to Pedroia despite being off balance. Frandsen wiped Pedroia out but he completed the double play to end the inning. Morales gave up four hits with two walks and two strikeouts. He has allowed three earned runs in 14⅓ career innings against the Phillies, all at Citizens Bank Park. The Sox worked over Philadelphia rookie Jonathan Pettibone (3-1) for four runs in the first inning. Ellsbury led off with a single to left field and went to third when Daniel Nava singled to center. Ellsbury scored when Pedroia grounded to second. It was the third straight game that Ellsbury reached in the first inning and was driven in by Pedroia. David Ortiz walked before Mike Carp slapped an RBI single to right field. After Drew struck out, Saltalamacchia lined a double down the line in right field and two runs scored. Pettibone is the sixth rookie starter to face the Sox this season. They have combined to allow 26 earned runs over 22 innings and none pitched more than five innings. The Sox are 4-2 in those games. Ortiz added a towering solo home run in the seventh inning. Since 2005, Ortiz has hit 20 home runs in 40 games and 171 at-bats as a first baseman.